French 'Spiderman' Alain Robert climb up till the tip of the KLCC tower(above-the red color circle) on Tuesday early morning around 745am. is really impressive to his action and this was his third time climb KLCC after the previous time is been caught when reach to floor 60 and finally success finish his own mission...here is a question that wanna ask whether Alain is planning to challenge this building(below) - Dubai new building Burj Dubai which the height is nearlly double compare to KLCC, 818m/2684ft and it only have 162 floors.....after the construction finish, it will become the tallest building in the world......what is the feel if working at the highest level of the building everyday?? 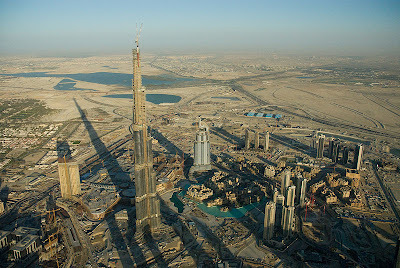 The construction of Burj Dubai.....OMG!!! !